Phthalo Green is a transparent, cool, bright, high intensity color used in oil and acrylics. It comes from a Phthalocyanine Blue pigment where most of the hydrogen atoms have been replaced with chlorine, forming highly stable molecules. Pigment PG38 differs from PG36 and PG7 in that a high portion of the chlorine atoms at the molecular level are replaced with bromine atoms. Bromine is reactively similar to chlorine, but causes a yellow shift that is especially noticeable in mixtures. Phthalo Green has similar pigment properties and permanence to Phthalo Blue. 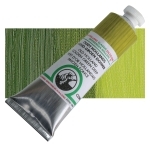 It is slow drying and an excellent base color for mixing a range of bright greens. Phthalo Green is considered a very good alternative to Viridian because it is intense and mixes well and can be used to emphasize mineral colors in various tints. However, its tinting strength is very high, so it can overpower other colors. Pigment PG38 has the strongest yellow shift of the variant forms of Phthalo Green. Pigment PG38 has no significant known hazards. Pigment PG38 is the result of recent research in the manufacture of other Phthalo Green variants. Because its manufacture is more expensive than that of Pigment PG36, its use has been limited.